Mahi Mahi is the Hawaiian name for dolphinfish. This fish is not to be confused with dolphins, which are actually mammals and a protected species. The dolphinfish inhabits tropical and sub-tropical salt water bodies all around the world, not just Hawaii. They are brightly colored and can weigh up to 50 pounds. Mahi-Mahi is a lean, firm fish with a moderate flavor. It is somewhat similar to swordfish in taste but with a flakier texture. The flesh is pink when raw and turns white when cooked. This fish is really ideal for grilling, provided you don’t overcook it. The George Foreman Grill is perfect for keeping the flesh moist. You can easily grill Mahi Mahi in 5 minutes on a basic Foreman Grill or in 6 or 7 minutes on a hot Foreman indoor/outdoor grill grill with the cover on by flipping the fish after the first 3 minutes. All it takes is a little salt and pepper, a brushing of olive oil and you’ll have moist fish in no time. But, that seems just a little too boring. How about we spice up this basic grilled fish by doing it Cajun blackened style. Mahi Mahi is pretty meaty, but not overpowering in flavor, so it should take well to the extra punch of herbs and spices. To cool things down a little, we’ll do a grilled fruit salsa on the side. Make the salsa first so the grilled fruit has time to soak up all the other flavors of the salsa recipe. Serve this dish with a side of seasoned white or basmati rice to round out the meal. With both recipes you will likely have to grill in batches, depending on the size of Foreman Grill you are using. 1. Heat your Foreman Grill to high. 2. Brush a little EVOO on the grill plates and grill the pineapple, onion, and jalapeno with the top closed for 1 or 2 minutes just to char the outside. 3. Dice or chop all grilled produce, add the cucumber, chili powder, lemon juice, EVOO, cilantro, salt and pepper. Put this aside or in the fridge to chill. 1. Make sure your grill is still hot. 2. Combine the dry rub ingredients, then coat the fish filets generously with it on all sides. 3. Brush the grill plates with EVOO. Grill the fish with the top closed for 3 to 5 minutes or until the spices and herbs start to darken. It is ok if they form a black crust. 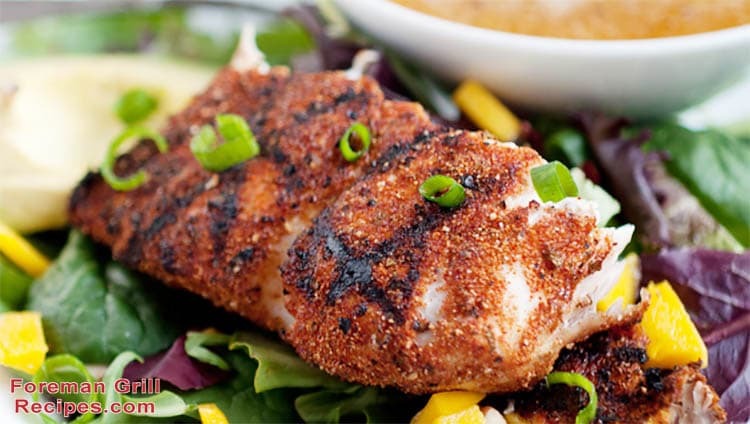 Serve the blackened fish with a healthy spoonful of salsa on top. If you don’t live in the tropics or Hawaii you might not be able to get fresh Mahi Mahi. You can get it frozen. That isn’t the end of the world with this particular fish. Thaw it overnight in your refrigerator and make sure to really pat it dry before applying the spice rub. Mahi Mahi is a great source of lean protein, B vitamins, selenium, and potassium. It is very low in trans fats, making it a heart healthy protein option. There are so many times that we grill fish on an open flame and basically kill it a second time. I have tried direct grilling, placing it in a special fish grilling basket, and grilling it on a soaked cedar plank. The fish stuck to both the grate and basket with the first 2 attempts and was very dry. The plank worked well until it literally caught fire and went up in flames charring the fish and leaving an unpleasant burnt cedar taste. Unless, you are grilling a whole fish, or steaming a fish in a foil packet over hot coals, the easiest way to ensure you have moist grilled fish is to just try it on a George Foreman Grill. You will get those distinct grill marks that will impress your friends and family.